A magnitude 7.0 earthquake shook Alaska Nov. 30, and since, more than 1,000 aftershocks have rippled through the state. The majority of the aftershocks were measured at magnitude 2.5 or less, with 350 higher than 2.5 and just about a dozen higher than 4.5. The quake's epicenter was eight miles north of Anchorage, and no deaths or injuries were caused by the quake, reported The Weather Channel (Dec. 3). Although resulting in no deaths or injuries, major infrastructure damage was reported following the earthquake. The Anchorage Daily News quoted state seismologist Mike West calling the quake the most significant since 1964. Mr. West reiterated reports of the destruction, saying, "I'm not aware of large-scale building collapses, but I think it's safe to say there are thousands of homes and businesses and buildings that were damaged in some fashion, be it a deck that slid downhill, a cracked foundation, a gas line disconnected from the house." It will clearly take some time for these Alaskan communities to get back on their feet, but compared to the 1964 earthquake, it seems Alaska may have dodged a bullet. The supply chain of food to the Port of Anchorage was not disrupted by the recent earthquake, and ships remain on schedule at the port, where about 90% of all goods sold in Alaska are delivered, reported Fresno Bee (Dec. 2). This was not the case in 1964. "'Reports still incomplete but indications are that Central Alaska plants suffered heavy damage. Especially hard hit were King crab canneries, as well as salmon and crab fishing vessels. It is expected that Pink salmon and King crab production in this important area will be seriously affected. 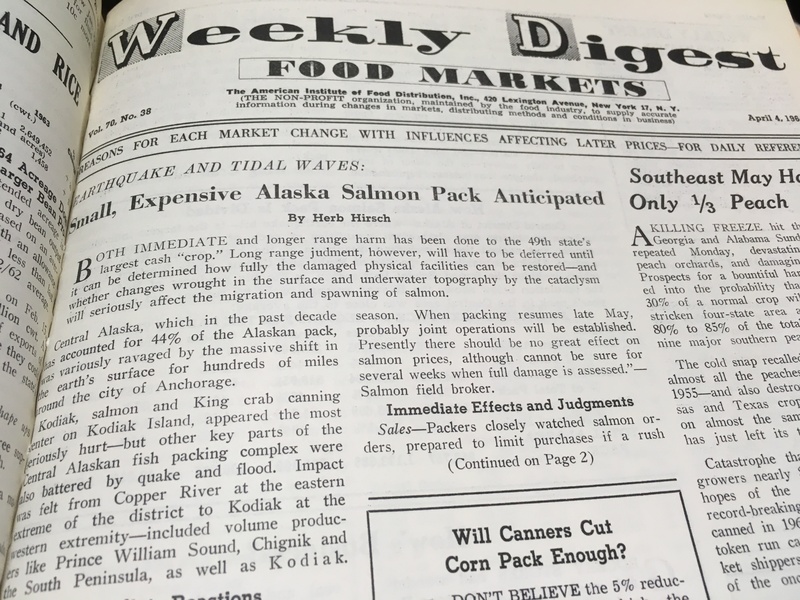 A substantial portion of the crab pack is produced at the city of Kodiak, which was badly damaged by the tidal wave following the quake.' - Large packer." History is often a sobering teacher. We here at the Food Institute will be watching the area closely as it relates to seafood harvests, and join the rest of the world in wishing the region a quick recovery and offering our thanks that no one was hurt.